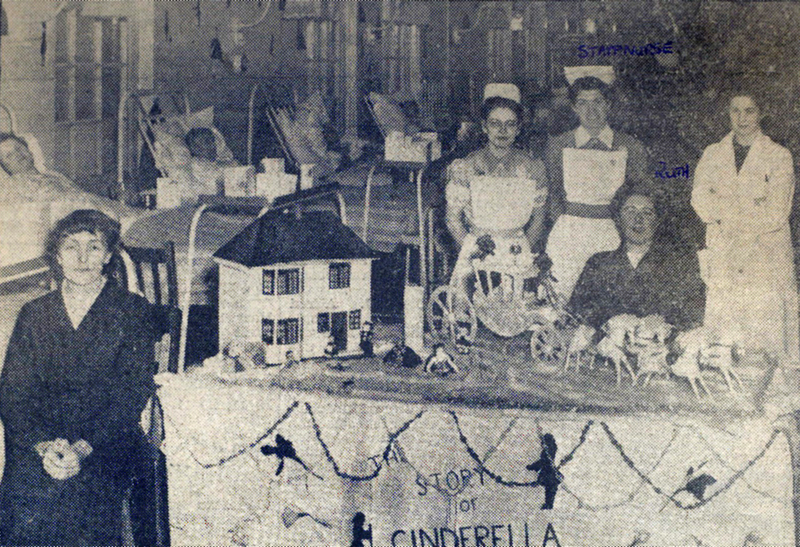 Photograph: A newspaper cutting of the Emergency Ward, Hallam Hospital, kept by Rita. Rita Bailey tells us what it was like to be a patient at two of the local hospitals. “In 1954 I broke my right wrist by falling when playing with friends on an ice slide on a piece of waste ground at the back of Holy Trinity church, West Bromwich. I was taken to District Hospital by my mother were asked to encountering Sister Pepper, who was well known for her strict no nonsense domineering attitude and loud voice, who ruled the department with a rod of iron. We were waiting to be seen there was a man who had cinder burn into his eyeball and the nurses having trouble getting it out, as he was squirming and moaning with pain. Along came sister who verbally ripped into him, got him into a kind of headlock and commanded ‘KEEP STILL. KEEP YOUR EYES OPEN’, then they set to work on him. This took place in full public view with everyone’s gaze transfixed on this poor man’s extreme discomfort. Then there was a lovely old couple – the lady was deaf and husband was very concerned about her. Sister demanded how the lady had broken her arm and was told she slipped on the ice while feeding the birds in her garden. Sister hovered overhead and shouted, ‘You shouldn’t feed the birds should you?’ This made the old lady very tearful, with the husband trying to comfort her. By this time I was cringing in my seat. When I did get to the treatment department the attitude of the staff was so different and so kind and jolly. This is how I came to take my 11 plus exam, writing with my arm encased in a Plaster of Paris. My grandmother Bessie had married William Bailey in 1906 and quickly had two children and was running Dining Rooms in Bull Street, West Bromwich, as well as looking after her father. By the time her 86 your old father had dementia and was blind, so obviously when she felt overwhelmed he was put into the workhouse, where he died in 1908. My hope is that they fed him and he was not just left to starve to death. Unfortunately the records for this workhouse seem to disappeared. My mother, Marjorie Bailey, had toxaemia during the time she was pregnant with me in 1944 and spent two months in Hallam Hospital. She told me there were a lot of injured soldiers coming in from the Second World War and she helped feed and wash some of those unable to do these things for themselves, as the nurses were run off their feet. A year later, she was admitted again and had a baby boy. He was named Arthur after my father, but only lived a few hours. My mother said he was baptised and I would love to find any records of his brief existence. Apparently midwife could baptise a baby in extreme circumstances such as this. When we were children some of my friends and I used to cycle past the hospital where there were patients in beds on the balconies, so used to stop and wave to them, just to cheer them up. We always got a wave back. Around the age of 12, in 1955, I had an emergency operation for appendicitis. I found myself in the emergency ward of Hallam Hospital where most of the patients were adults. Unluckily the operation didn’t go to plan and I was bleeding, so I did manage to see inside the operating theatre on the table and the big lights, but nothing was done at that point after I had been ‘unwrapped.’ I would add that over the operation scar was a pad, then over that a dressing which was a large square at the back with about six attached strips either side, these are plaited across one another at the front from the bottom up quite firmly. When the doctor made their ward rounds a nurse would undo this wrapping for the wound to be examined. Then off they would troop to the next bed leaving me to do up the strappings as best I could. My bed was in the middle of the ward, but I was moved to the end next to a window the other side of which was sister’s office. I learned from the lady in the next bed, who knew the ropes, that this was seen as a bad move regarding my progress, as they wanted to keep an eye on me. This frightened the life out of me, especially after listening to the death rattle of the lady in the opposite bed, which seemed to go on for hours. I don’t think anybody wants to know the rest about the bloody bits, so I’ll skip over that. All I will say is that others who had appendicitis operations came and went. Everyday I was having injections of streptomycin and penicillin until my aching thighs were like pincushions. A Scots nurse wouldn’t let me watch her give the injection and no wonder. As soon as I looked away she plunged the needle into me instead of doing it gently like the others. She was a right masochist. One day on doctors’ rounds the head doctor asked why I was having these injections and looked at the next in charge, who looked at the sister, who looked at the staff nurse and everyone was shaking their heads. So thankfully these were stopped. We were not allowed to stay in bed for long during the day. Patients sat around the table in the centre of the ward and chatted while making medical dressings. These were then placed in stainless steel boxes and sent for sterilisation. Then, as it was nearing Christmas, we help make a tableau out of cotton wool for snow. There was all ways plenty of comings and goings. At the other end of the ward was an old lady called Miss Florence Cunningham who was a friend of my grandmothers. She was a dressmaker and lived in a cottage lying back off the road next to Overend Chapel in West Bromwich. The cottage has long gone, but the chapel building is still there. Unfortunately she had what is now recognised as dementia, but as patients we just said she gone mad or, in local parlance, stark raving bonkers. The nurses had to periodically contain her by putting up the sides of her bed. Other times she roamed the ward striking our beds with her stick and threatening us. The only thing we could do was cower under the bed sheets. One evening she tried to escape and one of the nurses stood in front of the ward exit door, which was near my bed. Miss Cunningham shook her stick and said, ‘I want to see the vicar of the church to complain.’ On one occasion my grandmother came to visit and I told about Miss Cunningham. Granny asked if she could take some my grapes to her, but apparently Miss C. took them and placed them in her bed and property sat on them. In a hospital ward you always seem to get one person who disrupts the peace and quiet everyone else. A lady was brought in who was quite pleasant to speak to during daytime, if a bit rough looking, but when she slept she argued and shouted in her sleep and kept a lot of us awake at night. People didn’t swear so much in those days, especially females, but she had an extensive shocking repertoire and I heard terms I have never heard before. It was funny at first, you could hear a few chuckles coming from different beds, but then some desperate patient would yell, ‘Shut up!’ This didn’t always work.